SAME DAY SHIP if ordered before 2pm EST, if not, 24 hour ship. No initials or changing of Apple Watch location- as is. The stain is Kona, the Apple Watch charger is on the front watch bar. We have gift wrapped charging stations for special occasions for years now. We have decided to start advertising our gift wrapping for our docking stations. Please see attached photo and the gift wrapping option to your cart at checkout to have your item gift wrapped. 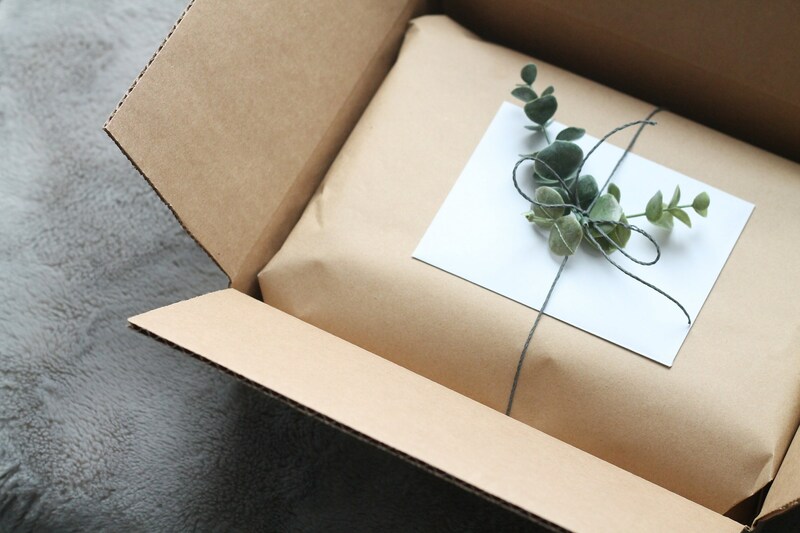 We will ship it directly to your loved one with no receipt of the price. Give that special touch to your gift for an additional fee at checkout. 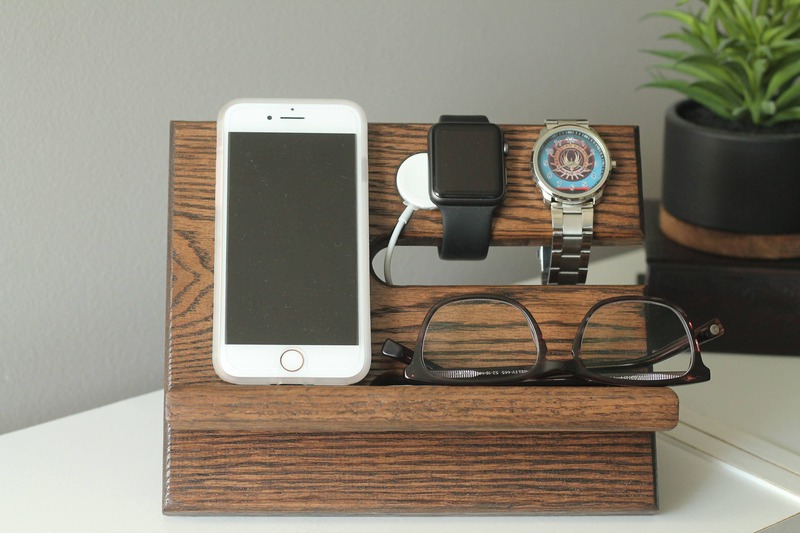 Both versions of the Watch and iPhone dock is made from solid oak construction, handmade, hand-stained here in the US, and made to order. Sturdy, solid, and heavy duty! There are similar listings out there, but are made with cheap plywood- not 100% solid oak like ours! Hand stained and polyurethane finish standard. The valet will come in 2 pieces, with simple assembly required to make it as pictured. Manufacturing it in 2 pieces allows you to deconstruct the valet and travel with it if the need arises. This valet is not available in one solid piece, and does not fit together tight- this allows wiggle room and expansion of the wood. 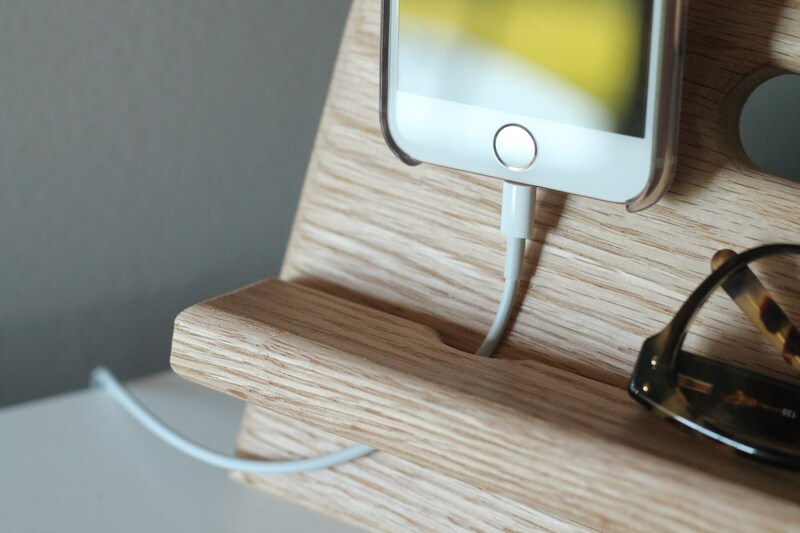 This dock will hold your phones- (pictured iPhone 5s)the bottom piece is built to allow a charging cable to come up underneath to be plugged into the bottom of your phone. (See Pictures) An iPhone 6+ and the Droid equivalent will fit on here, but will stick up above the wood. This valet also has a place to hold watches- depending on the size, 2-4 watches and exercise/fitness trackers. We also offer a valet without a section for watches, so you are able to keep a tablet and a phone on it. Under the section for watches, there is a shelf for jewelry, glasses, chapstick, or whatever you want! See our custom listing for a section for rings. Accessories for display only, does not include any chargers. Also, make sure you put the charger into the wood slot prior to assembly. Friction fit holds the charger in place. 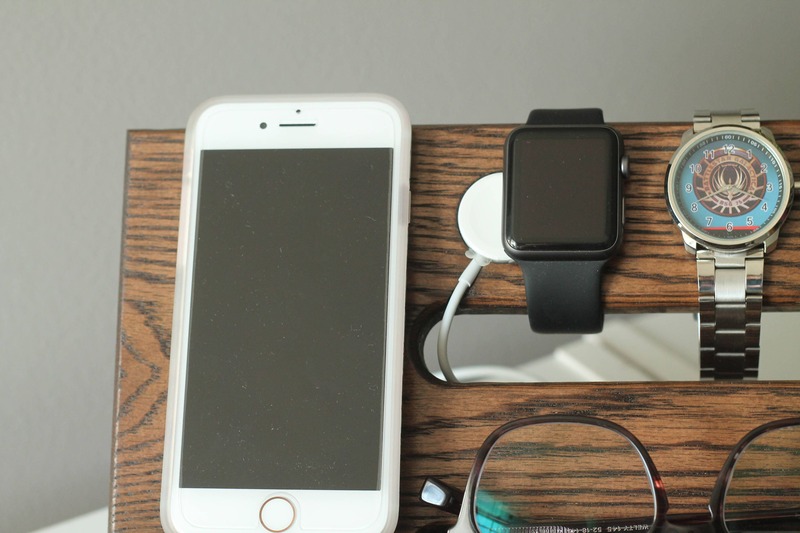 Magnetic characteristics of the charger allow both designs to hold your Apple Watch in place.